The valley of Kashmir is known all over the world for its beauty and charm. The Kashmir valley is situated about 300 km. from Jammu across forested ravines and steep mountain passes. The emerald valley of Kashmir is cradled in the Himalayas, under the crystal blue skies, against the background of snow-capped mountains. It is a magic land of silvery streams, rivers, fresh water lakes, pine, deodar and chinar forests, snow clad mountains, sparkling waterfalls, shikaras, green meadows and grassy slopes full of flowers of vibrant colours. It is an oval plateau over 5000 feet high and framed by three Himalayan ranges – the Karakoram, Zanskar and Pir Panjal. Kashmir covers an area of 222,236 square kms and is often referred as the 'Switzerland of the East'. It is the land of bewitching beauty with exotic fruits, flora and flowers. Srinagar, the capital of Kasmir is nestled amidst the huge lakes, meadows and unique floating gardens in the valley. The state of Kashmir is mainly dominated by the Muslims and Kashmiris. Pandit Jawahar Lal Nehru also said about Kashmir that is there is a paradise on the earth, it is this, it is this. Kashmiri, Dogri and Urdu are the main languages which are spoken here. The best time to visit Kashmir is during summers. Kashmir formed part of the empire of Emperor Ashoka, about three centuries before Chirst. He spread Buddhism in Kashmir, Tibet, China and Central Asian Republics. In the 7th and 8th centuries, there was a succession of Hindu kings who gave Kashmir its first impressive monuments. Then followed a dark era in which power passes from one ruthless commander to another till a Tibetan Muslim prince took over. He died in 1338 and Commander Shah Mir usurped the kingdom and stated a Sultan dynasty. The eighth Sultan of this dynasty was Zainul-Abdin, also known as Badshah or the Great king. He patronised art, music and encouraged studies in Hindu and Buddhist scriptures. The king was very popular with the local people as they considered him their patron saint who introduced such arts like shawl making, embroidery, carpet-weaving, papier-mache, silver and wood carvings. He invited guilds of craftsmen from Persia and Samarkand to settle down in the Kashmir valley. When Mughal Emperor Akbar conquered Kashmir in 1587, he lost his heart to the valley. He declared Kashmir as his private gardens and indulged himself in boating, water fowling and watch the saffron being harvested in the fields. Various Mughal kings made Kashmir their home to avoid the heat and dust of summer. Akbar's son Jehangir also found the natural paradise of Kashmir captivating and built various gardens in Srinagar. While, one day on his way to Kashmir, he become ill and when he was asked to express his last wish, he said, “Kashmir… and nothing else.” The Mughal kings created elaborate pleasure gardens, marble pavilion and intricate irrigation systems in the valley. They also succeeded in converting the majority of local Hindus into Islam. As the Mughal power decline, Afghans captured the valley till they were ousted by the Sikh Maharaja Ranjit Singh. Kashmir became part of the Sikh empire. When the Sikhs lost their war against the British in 1846, the British demanded an indemnity of 500,000 pounds. Since they could not meet this demand, the Sikhs offered Kashmir to the British. The Dogra Maharaja of Jammu offered the British twice the indemnity amount and thus became the Maharaja of Jammu and Kashmir. His descendants ruled over the State till 1947 and became part of the Indian Republic. The state also became the battleground between India and Pakistan during 1948, 1965 and in 1971 wars when Pakistan lost. Pakistan is still trying to grab Kashmir by aiding and abetting terrorism in Kashmir. Since 1997, when elections were held in the state, Jammu and Kashmir is under an elected government. Law and order situation is better now and foreign as well as Indian tourists are visting Kashmir in large numbers. The main heart of Kashmir is the fertile Vale of Kashmir, also known as the valley. 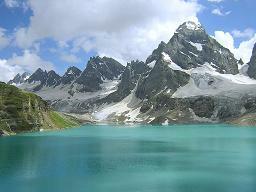 The Vale of Kashmir lies between the Himalayas and the Pir Punjal mountain range. The valley is set apart from the plains to the south-west by the Pir Punjal range, through which runs the imposing 9,760 ft. Banihal pass. The climate is mild. Mount Godwin Austen or K2 (28,250 ft) and Nanga Parbat (26,650 ft) lies in the northern Kashmir. The Indus and Jhelum rivers flow through Kashmir and the Vale of Kashmir respectively. 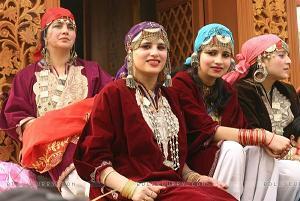 The people of Kashmir are popularly known as Kashmiris. Most of the Kashmiris are Muslims, followed by Hindus, Sikhs, Buddhists and Christians. Among the Kashmiris, Kashmiri Pandits who are Hindus, are a progressive community, scattered all over India. Pandit Jawaharlal Nehru and Indira Gandhi were part of the Kashmiri Pandit fraternity. Most of the Kashmiri Pandits have been recently forced to leave Kashmir due to a communal frenzy by the Muslim fundamentalists. replaced by the Bacha Nagma, performed by young boys dressed like women. The bhand jashna (festival of clowns), is a 300 to 400 year old Kashmiri folk theatre that was performed in village squares and satirizes social situations through dance, music and clowning. Kashmir is known for its exquisite craftsmanship which flourished over the centuries. During the winters, the craftsmen make handicrafts and sell them to tourists coming there during summers. 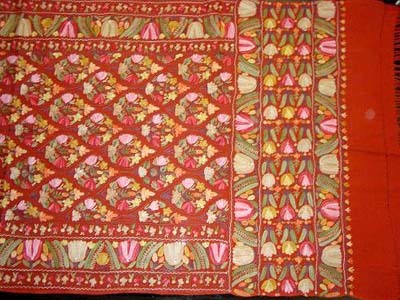 Some of the famous handicrafts of Kashmir are the hand-knotted Persian rugs and traditional rugs, carpets, embroidered woollen caps, shawls and jackets, the Jamawar, silk-soft Pashmina shawls, crewel embroidery, embroidered gold and silver dresses, caps, boleros and ponchos, stone studded jewellery, filigree, enamelware, articles made of beaten and carved silver, articles made of walnut wood and papier mache, silks and embroidery. Wood carving is another special art of Kashmir which is very unique. The walnut furniture made in Kashmir is exquisite and work done on the furniture speaks about the Kashmiri's patience and workmanship. Kashmir is also known for the Kashmiri saffron, which is very expensive. But, only a small quantity of it provides flavour to a dish. Walnuts and almonds are available throughout the year. Shah Zira, Kashmiri chillies and honey are the other items which are grown in Kashmir. During festive occasions, the Kashmiris serve a feast called Wazwan. The Wazwan consists of 36 meat dishes prepared specially by highly trained chefs and eaten together. The feast begins with the passing around of the Tash-t-Nari for guests to wash their hands, followed by the various delicacies served in large silver platters or thramis piled high with long grained rice crowned with Dum Kokur (chicken cooked in saffron scented yoghurt), Alu Bukhara Korma (mutton simmered in a splendid sauce of yogurt, almonds and plums) along with methi, Rogan Josh, Kebabs, vegetables, gushtaba, Tabak Maaz (crunchy rib chops), Seekh Kababs and chutneys. The dessert is usually phirni and Kahwah. Kahwah is the green tea, flavoured with saffron, cardamom and almonds. Kashmir is just like a Himalayan Paradise on the earth. Some of the famous places to visit in Kashmir are Srinagar, Pahalgam, Gulmarg, Sonamarg and Yousmarg. Srinagar is the capital and heart of Kashmir. There are various gardens and lakes in Kashmir. Wular and Dal lake are the famous lakes in Kashmir. When it floods in spring ans summer, the Wular lake reaches 260 square km in size making it one of the largest lakes in India. In winter, it decreases considerably in size. The Dal lake is the smaller lake and covers 38 square km. Srinagar is situated around the Dal lake. The trekking in Kashmir and Ladakh is very different from the trekking in Nepal. Before the recent disturbances, no special permission was required to visit Kashmir or Ladakh. But today, it is impossible to trek from the Vale of Kashmir, though it is still possible to get into Ladakh. There are wide open spaces in Kashmir and Ladakh and a sparse population in the trekking areas. While trekking, you will be moving through the countryside that is used for grazing. The feeling of being in a wilderness area is possible in Kashmir and Ladakh. Some of the famous trekking points in Kashmir are Kishtwar to Kashmir, Kishtwar to Chamba, Kishtwar to Zanskar, Sindh and Lidder valleys, Lidder to Sindh valley trek via the Yemhar Pass, Sonamarg to Haramukh and Kashmir to Ladakh. Jammu is the nearest railway station for Kashmir. From Jammu, the tourists can either take the flight or travel by road to Srinagar. Before the Jawahar tunnel was completed, the journey took two days with an overnight stop at Batote. Now, it can be covered in one long day.